In this month’s episode of the podcast, Sally Rooney is joined in studio by Mia Gallagher to read and discuss ‘Ten Days, Counting Slowly’, a short story by Jennifer Brady. ‘Ten Days, Counting Slowly’ was first published in our Summer 2008 issue, and is included in our new anthology, Stinging Fly Stories. Mia Gallagher is the author of two acclaimed novels: HellFire (Penguin, 2006), awarded the Irish Tatler Literature Award 2007, and Beautiful Pictures of the Lost Homeland (New Island, 2016), longlisted for the 2016 Republic of Consciousness Award (UK). Her first short-story collection, Shift, has just been published by New Island, and is already garnering critical attention. Previously, Mia’s short fiction has been anthologised and published widely in Ireland and abroad, shortlisted for Hennessy and Bowen/Trevor awards and awarded the START 2005 Chapbook Award. She has received several Literature Bursaries from the Arts Council of Ireland, is a contributing editor to the Stinging Fly, and has also written and devised for the stage. She has enjoyed the role of writer-in-residence in many environments, including universities, schools and Farmleigh stately home. 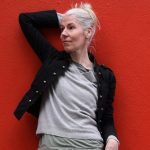 Her reviews, articles and essays have been published in the Irish Times, The Guardian, the Sunday Independent, The Stinging Fly, Architecture Ireland, Circa, Books Ireland and in a number of anthologies. Mia is currently working on a new novel, and has just been elected as a member of Aosdána. Jennifer Brady is a writer from Dublin, Ireland and has stories published in The Stinging Fly, Southword Journal, Tell Tales Volume 4, Incorrigibly Plural and These Are Our Lives. She has non-fiction published in A Grand Gallimaufry.